Steve Jobs did something during Macworld Expo 2008 that Apple customers have rarely seen him do. He admitted that he might have, maybe, made a small mistake in the AppleTV. The result is the free to download software update dubbed AppleTV Take2. The update changes the AppleTV from a simple bridge between your iTunes library and your television and turns the device into a much more powerful tool. The way I used to describe the AppleTV is that it was an iPod for your television. It worked just like an iPod, allowing you to sync movies, TV shows, music, and podcasts to the device though iTunes, to the device. Customers didn’t seem to be interested in that style of device, although I was very happy with the AppleTV before the update. Take2 takes the AppleTV to the next level allowing you to rent movies, buy music and TV shows, and download podcasts on the device itself. These are features that should have been included since day one. The update makes the AppleTV feel like a much more complete device. 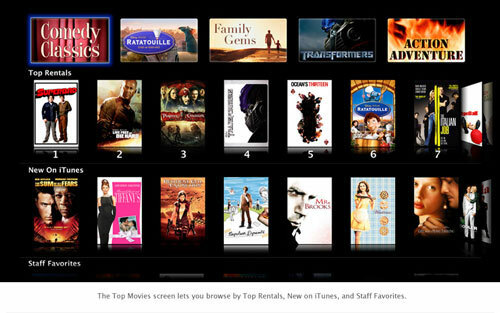 The newest addition to the iTunes store is the ability to rent movies. Movie Rentals range from $3 for older titles to $5 for HD content. Rentals last for 30 days after purchase and 24 hours after you begin watching the movie. Movie rentals from the AppleTV work beautifully. The movies are displayed by showing the artwork in rows allowing you to quickly glance though nearly 800 titles at the time of this review. HD content is still lacking, however, with fewer than 100 titles. Each of the four movies that I rented was available to watch in under a minute. The AppleTV is able to gauge the speed of your connection and estimate how long it will take for the movie to download, and then it tells you when you can start watching. If the AppleTV is correct you will never notice that the movie is still downloading as you watch it, and I haven’t yet run into the situation where I could not continue watching the movie because it had not cached enough of the film. There is a downside to renting movies on the AppleTV. While you can send movies you have rented from your computer to the AppleTV, this does not work the other way around. If you happened to queue up a few movies you plan to watch on the AppleTV and want to instead watch them on your Mac or your iPod, you’re out of luck. 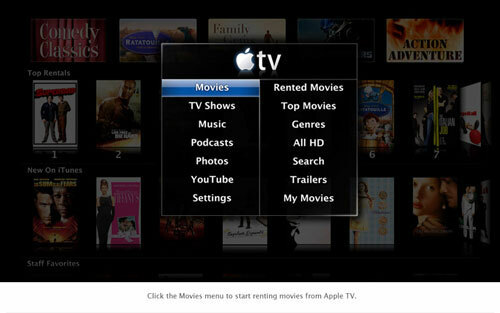 Also, for some reason I cannot figure out, you are not able to buy movies on your AppleTV. This turns into a problem, for example, when I rented “Stardust.” I would have preferred to buy it for the full $15 but did not know the option existed. You can tell this is an agreement Apple was forced to make with the movie studios. Apple would not go out of their way to limit the functionality of their device. The new menu system is the same as movie rentals. Other than that, no new features are gained in the iTunes store itself. However, the experience with TV Shows and Music are in ways superior to that of movies. You are able to buy individual episodes, whole series, and season passes directly from the AppleTV, then sync the content back to your computer. Apple aided the rise in the popularity of audio podcasts when they added podcasts to the iTunes store. Adding the ability to browse and download podcasts directly to the AppleTV feels like Apple is attempting to do the same thing for video podcasts. I’ve gotten the most use from AppleTV by watching video podcasts. I’m able to sit down in the morning or during my lunch break and watch great free content. I only really understood short form video content on iPods after I got the iPhone and was able to watch three or four minute shows like RocketBoom or Geekbrief.TV when I had a few minutes of idle time. The AppleTV does something similar. When you have that ten or fifteen minutes before you need to leave the house, having short form content makes sense. I used to take advantage of that time sitting on my computer, and putting it on a large flat screen TV makes the experience that much better. The AppleTV puts video podcasts on the same level as movies or TV Shows. The feature that really upsets me about the AppleTV’s podcast functionality is that you cannot subscribe to a podcast on the AppleTV. There are HD versions of podcasts I watch that are too large to keep on my hard drive and too large to play on the iPhone. I don’t want them on my computer before sending them over to the AppleTV. You can favorite a podcast, which is essentially bookmarking its location in the iTunes store, but you still have to manually download or stream the content, eliminating the purpose of using an RSS feed. Still, the slick menu system makes discovering new podcasts enjoyable, but they need to add an RSS Feed Reader for me to take advantage of access to the iTunes podcast directory though the Apple TV. Lack of support for some of the more common video formats such as Dvix is an inconvenience. Much of the content I’ve collected on my computer is in .avi format. Apple needs to consider either supporting more of these common formats or make it easier to apply a codex to the device. Other media extender devices such as Microsoft’s Xbox360 have adopted Dvix support. If AppleTV doesn’t allow support for Dvix and other common video formats then Apple is going to miss a major audience for the device. There are some wireless syncing issues that make the process of getting content to the AppleTV frustrating at times. After a few minutes of syncing the AppleTV will drop out of iTunes but continue to sync at least the last file it was working on before the drop out. To get AppleTV back into iTunes requires a restart of the program or even reboot of the machine. I did not encounter these problems when over a wired connection. It may be that my router and the AppleTV just do not want to play nicely together. The Take2 software update is a great improvement over the original AppleTV by making the features that I enjoyed about the original device better. 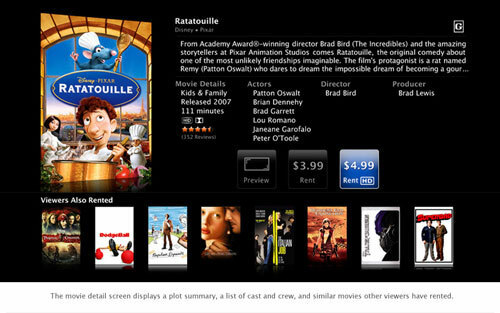 The direct access to the iTunes store and Movie Rentals enhance the overall experience, eliminating the need to use a computer to get content onto the device. The functionality that it lacks, even though minor, hurts the overall experience and at times makes using the device frustrating. The AppleTV is going to be the beginning of the end of hard media. The idea of having a massive library of TV Shows, podcasts, and a decent sized library of movies available without leaving your living room couch is going to begin a mental change in the way that the average person thinks of video content. Just as the iPod changed the way the average person thinks about audio content.